Customer Satisfaction Management Associates. - CSI Tar Pit 2. Congratulations! You have your deal. I will take your car to the get ready department so it will be ready when you finish up in F&I. It will be a few minutes to get the paperwork ready, so have a seat in front of our TV streaming commercials and they will call us when they are ready. Oh, yeah, if you hear your name called and I’m busy, go see George. 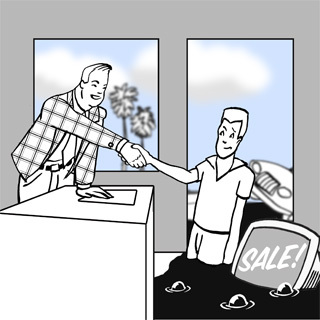 The salesperson escorts the client to the CSMA desk and lets the client know he will be getting the car ready for delivery. The CSM Associate provides an accurate asessment of the time until F&I will be ready with the paperwork. The CSM Associate sets up Onstar equivalent, satellite radio and any other computer mediated adds. The CSM Associate then goes over manuals, and lets client know what to expect in F&I. Procedures for longer delays due to a line for F&I will be established. CSMA provides all the training including the word tracks and scenarios for the CSM Associates to smooth the transition to F&I.